One day soon, the world will suddenly discover that the European Project is authoritarian because they believe the people are stupid and politicians know better. When that day dawns, the crisis in Europe will erupt in total shock and this will undermine the entire economy which has rapidly fallen to even behind China. At the core of this true European Crisis is the fact that individual human rights come behind the rights of government. Make no mistake about it, politicians in the West secretly admire China and in turn, many Chinese view the model for democracy in the West is crumbling before their eyes. Germany has arrested the former Catalan Prime Minister Carles Puigdemont enforcing Spain’s dictatorship and anti-Democratic government to save the EU. Spain is by NO MEANS a democratic nation and evidence of that statement is the Spanish Constitution. I know readers in Spain will write emails saying I am wrong. All I ask is keep reading. The Spanish Constitution exempts all politicians and Judges from the law and denies the right of the people to even disagree with the government. Puigdemont was arrested on the German-Danish border traveling from Finland to Belgium. The state police office in Kiel announced that Puigdemont had been arrested and the charge is advocating a democratic vote in Catalonia to separate from Spain. This is the most outrageous legal persecution that has taken place since the Communist Revolution in Russia who imprisoned or killed anyone who opposed them. Puigdemont proclaimed Catalonia’s independence from Spain in October, that Madrid says violated the constitution. Their interpretation of their Constitution is permanent slavery no different from the positions of France and Britain that justified the French and American Revolutions. Then the Spanish judiciary began investigations into rebellion and charged Puigdemont and other leading separatists who were forced to then flee to Belgium into exile. Clearly, anyone who is charged with a political crime MUST leave Europe for the governments will conspire to save the EU. Puigdemont went to Finland to attend a conference and Spain submitted an application for the arrest of the deposed regional president. Finland then agreed to arrest Puigdemont so he fled to return to Belgium. Germany intercepted him and arrested him and he now faces 25 years in prison where he will certainly die. Spain’s Supreme Court opened criminal proceedings against Puigdemont and other regional politicians. Imprisoning people for their political ideas has been the hallmark of tyranny. It is a sad day to watch the ruthless behavior of the Spanish government and its Judiciary which is a disgrace to their nation and the Spanish people. The entire problem underlying this crisis exposes the Spanish Constitution that NEVER truly provided a democratic nation for it did not provide a workable transition from dictatorship to democracy. This Spanish Constitution is a contradictory document that denies any democratic resolution or process and maintains the Franco Dictatorship. In Spain, all members of parliament, including those in regional parliaments, enjoy immunity, judges cannot be dismissed. The Constitution defines political parties as “the main instrument of political participation” (Article 6), giving them a role that goes far beyond the process of public opinion-making, as understood in most democracies. In Spain, the self-interest of government prevails over the rights of the individual. This is the plain reading of Article 155 (see below). The Franco regime organized the Society around its National Movement and the vertical, professional syndicates. Therefore, it was not even the people as a whole that was considered to be the nation but the party. Following the dictator’s death, Spain did open up to political and trade union pluralism, but there was no real redefining revision of Franco’s means of dictatorship. The citizens do not vote for deputies, but closed lists of a party whose candidates move into Parliament depending on the number of votes. MPs do not have offices in their constituencies. There is no actual representative form of government when you look closely at the structure. There is no actual accountability for the political party itself and they are isolated from the public opinion and their own base. This is why political corruption runs ramped in Spain – there is no actual direct representation or accountability. The Spanish section of Transparency International called on the parties to abolish the closed lists and publish their campaign budgets no later than three months after the election back in 2014. Nothing has been done. The entire Spanish Constitution contradicts the European Convention on Human Rights (ECHR) is an international treaty to protect human rights and fundamental freedoms in Europe. Article 10 of the ECHR provides the right to freedom of expression and information, subject to certain restrictions that are “in accordance with law” and “necessary in a democratic society”. This right includes the freedom to hold opinions and to receive and impart information and ideas. However, the Spanish Constitution outright contradicts Article 10 by its Article 155. Clearly, the Spanish Constitution was no more than a compromise between democracy and Francoism. 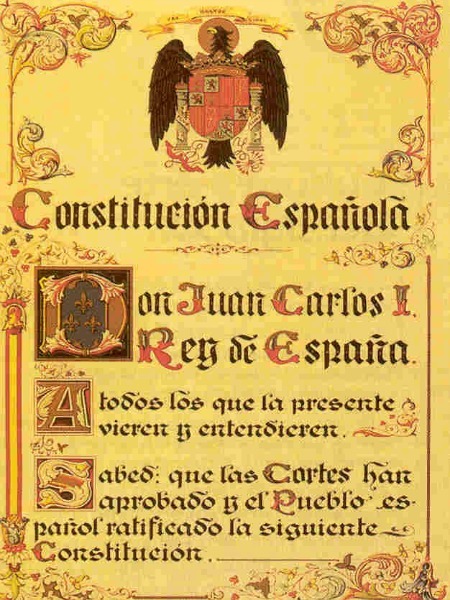 Above all, the fathers of the Spanish Constitution wanted to prevent a civil war by retaining an authoritative clause that allowed dictatorial action. The new constitution was therefore settled between an authoritarian, national Catholic leader system and a democracy and has never actually placed individual liberties in a role of importance violating the very idea of human rights. The Spanish government will undoubtedly fall. It will be 43 years and ripe for its complete collapse in 2021. The arrest of Puigdemont proves beyond a shadow of a doubt that the Spanish Constitution denies freedom of expression and human rights. Puigdemont did not engage in violence and thus is simply a political prisoner and Germany is endorsing the dictatorship of Spain. No one in the EU leadership stands for public election either. No wonder they too support Spain. Consequently, the Cortes approve and the Spanish people ratify the . . . Constitution. 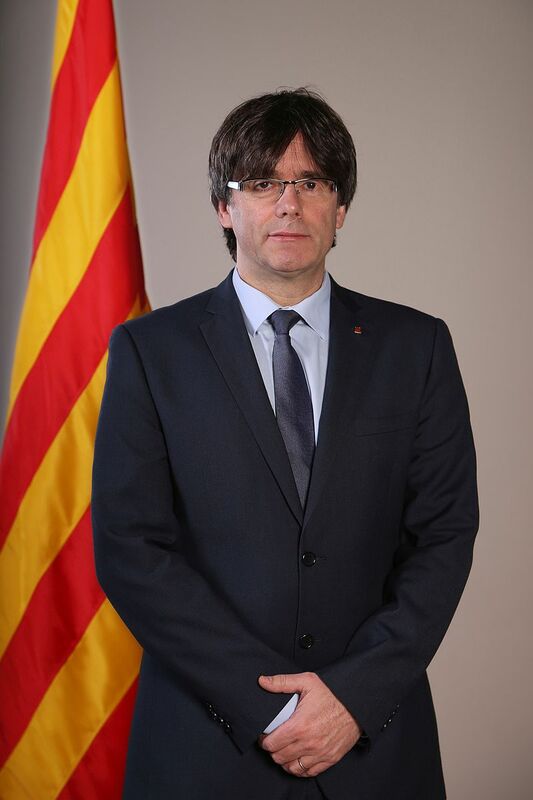 If a Self-governing Community [e.g., Catalonia] does not fulfil the obligations imposed upon it by the Constitution or other laws, or acts in a way that is seriously prejudicial to the general interest of Spain, the Government, after having lodged a complaint with the President of [that] Self-governing Community and failed to receive satisfactory response, may, following approval granted by the overall majority of the Senate, take all measures necessary to compel the Community to meet said obligations, or to protect the abovementioned general interest. With a view to implementing the measures provided for in the foregoing paragraph, the Government may issue instructions to all the authorities of the Self-governing Communities.